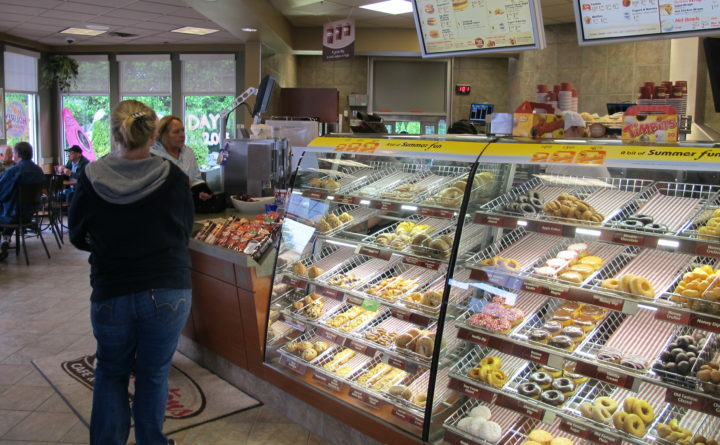 A Tim Hortons display case in Bangor is pictured in 2013. The Tim Hortons on Lunt Road in Newport has closed. The closure, announced Friday by the Maine Department of Labor, leaves 12 locations in Maine for the coffee and doughnut chain, which originated in Canada, where the majority of its stores still are located. Presently, 10 of the 12 locations are in Penobscot and Aroostook counties, with one in Kennebec and one in Washington. The number of Tim Hortons locations in Maine has fallen sharply in recent years. In 2012, there were 25 Tim Hortons locations in the state. In 2013, locations in Rockland, Augusta, Portland, Skowhegan and Lewiston closed. In November 2015, six locations in Maine closed; two each in South Portland and Auburn, and one each in Lewiston and Augusta. An Ellsworth store closed in 2017. According to a 2018 Bloomberg News story, Tim Hortons closed around 14 percent of its U.S. locations between 2015 and 2018. The Maine Department of Labor on Friday announced a rapid response help session to assist former employees to be held Wednesday at 10 a.m. at the Newport Town Office. The Maine Department of Labor offers rapid response sessions in the wake of multiple job losses when a business closes permanently or temporarily, or lays off a significant number of workers. In recent months, sessions have been offered for employees who lost jobs when Taco Bell restaurants closed in January in Augusta, Auburn, Portland and Biddeford, and for employees of businesses affected by the large fire on Lisbon Street in Lewiston in December. The sessions provide workers with health insurance options and re-employment assistance, in addition to information about unemployment benefits. The number of employees affected by the Newport closure wasn’t immediately available Friday.